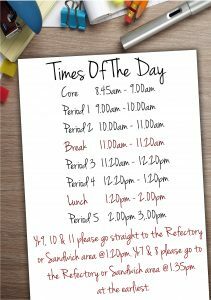 At Bramhall High school the day is split into five one hour lessons. Students are given a break at 11.00am after period 2 for twenty minutes. At this time they have the opportunity to get some food or a drink. Students have 40 minutes for their lunch after period 4 at 1.20pm. At this time the school refectory is open for hot and cold food. Students are expected to be in class for core time by 8.45am. The school day ends at 3.00pm and buses are available to take students home at this time. Many students take advantage of the many after school clubs available and these run into the early evening.